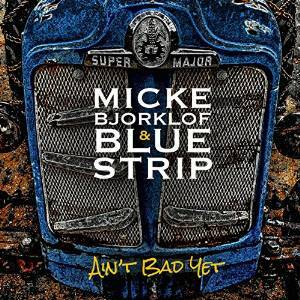 I just received the newest release, Ain't Bad Yet, from Micke Bjorklof (pronounced Be-York-Loaf)& Blue Strip and it's an excellent blues rocker. Opening with Last Train To Memphis, a driving rocker with great blues riff. Vocalist Micke Bjorklof leads the way and guitarist Lefty Leppanen chases on slide guitar backed by Teemu Vuorela on drums and Seppo Nuolikoski on bass. On Sweet Troublemaker, the band picks up a serious rock beat heavily reinforced by Vuorela on drums and Nuolikoski on bass. Tim Lewis joins on keys with Micke on lead vocal, Lena Lindroos and Veera Railio on backing vocal and Lefty on slide. Excellent rocker! Lefty opens Rain In Jerusalem with really rich, thick slide tones reinforced by Lewis on keys. With Timo Roiko-Jokela on percussion and Vuorela on drums, this track has a super rhythm. Super track! Offbeat funky, Get Ya In Da Mood has it's own sound and Bjorklof adds blues harp to his lead vocals. Lefty lays down a really nice guitar solo with trem bends and stinging blues riffs, heavily reinforced by TRJ and Vuorela. Very nice! Slinky, Hold Your Fire Baby is one of my favorite tracks on the relese. It puts me in mind of a super track/remake by Al Green and Savoy Brown of an old Temptations track. It just has a super groove and I really like the hooded vocals with harp over the mix. Excellent track! On title track It Ain't Bad Yet, Lefty digs in on resonator accompanying Micke for a somber ballad. With it's island jazz mix, Rat Chase, the band shows it's real versatility, creating a totally Caribbean feel. With heavy snare/cymbal beat and bass reinforcement, pushed along byLewis on keys, Micke really ramps up on this track vocally filling the air with smoke on harp. Excellent! Sweet Dream's A Sweet Dream is the purest radio track on the release but even with it's super hook and contained vocals, Lefty screams out great guitar riffs and Nuolikoski drives a great bass rhythm. Today has a ramblin' country blues feel with finger picked banjo like guitar and light percussion. Two stepping, Blame It On The Bright Lights, has just a tint of 60's beach music with easy vocal harmonizing. Vuorela maintains the tracks steadiness with tight drums and Lefty steps in with a flashy stylistic guitar solo. Wrapping the release is In Chains, an excellent primitive style blues with crisp with New Orleans style stumble drumming, warm slide work and perfectly thought out harp trimming. I really like Bjorklof's vocals throughout and blended with Leppanen, Nuolikoski, Lindroos and Railio, this is a tough combo to beat. This is an excellent release!